Bought a big bag of passionfruit for $2 (I love passionfruit) and made my first ever batch of passionfruit butter - it's beautiful! Will only be a treat though, it takes five eggs! The rest was squeezed into an ice cube tray and frozen for adding to yoghurt, pavlova at Christmastime and icing for sponges. I have the equivalent of seven tins of passionfruit pulp, a real saving (around $10!). This week I've bottled 15 jars of diced tomatoes (four x 300ml jars, 10 x 600ml jars). No brine or salt, just tomatoes. These will be used to make salsa or I'll be able to use them in any recipe that calls for diced tomatoes and I've added to our food stockpile. 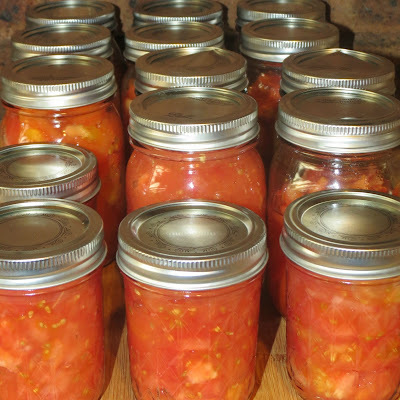 The tomatoes cost $3.94 for 6 kilos and I was given 2 kilos, so 26 cents a jar. Used the microwave for the bottling and the whole process only took 1 hour 12 minutes all up. Found a couple of tomato plants on the throw-out trolley at the nursery for $1 each so I bought them, soaked them in the laundry sink overnight and planted them out on Tuesday. They seem to be doing well, hopefully they'll give us lots of tomatoes during the summer. The beans and peas I planted a couple of weeks ago have come up and are doing well. Planted more bush beans and some zucchini plants. These will provide food for us during the summer and produce enough to be able to preserve them for next winter. Emptied the worm castings from the worm farm and added them to the empty garden beds. Caught water in the kitchen and showers and used it to top up the washing machine, water the plants and wash the floors. Found a beautiful birthday present at a new op-shop, for $10 - saved $5 on our gift limit. Put that $5 into the grocery slush fund where it's needed. The gift budget is OK and doesn't need any help. Made a card and put together a gift for a friend who has just had a beautiful little boy, using things I already had. Wayne was able to repair my laptop - such a relief, I use it constantly as you can imagine. I was afraid I'd have to make a rush decision on a new one, and while I've never been entirely satisfied with this one (Hannah says I'm just fussy) and a new one would be lovely, the thought of being rushed and pressured into a new one didn't thrill me at all. Instead a few minutes exploring what the problem was, a few minutes on Google, a phone call to a friend and it was done, good as new. Cost: $0! Bought Claratyne on sale at Chemist Warehouse for $29.99 (down from $36.99), then filled in the rebate form and sent it off for another $5 off (thanks for the heads up Wendy). Then went back and bought another box as the fine print reads "one per customer" so filled out the rebate in Wayne's name for another $5 off (and it can go into the first aid stockpile). Total cost $59.98 for 140 tablets, saving $27 all up. Dried the washing either on the clothesline in the sunshine or on clotheshorses inside. Used a free delivery coupon to get some groceries delivered. Everything was on sale, all but one item was on half-price sale. Total came to $82, saved $79 - I was so happy with that and I've crossed two more items off my stockpile shopping list. Cooked all our meals from scratch - didn't stick to the meal plan but we still managed to eat from the freezer and pantry. Enjoyed a free card making afternoon yesterday with lovely friends and learned how to make two pretty dress style cards, a really simple flower embellishment, and a One Sheet Wonder set. Maureen brought some plants along - lavender, daisies (two of my favourite flowers) and succulents that I gratefully will use in the garden and to make gifts. Not a whole lot happening in terms of new ways to save money, but it has been a very frugal and productive week and I'm happy and content with what I've accomplished and now I'm off outside to potter in the garden, enjoy the sunshine and contemplate other ways I can look after my family and our home. How did you save money, time or energy this week?